Only one of last year’s grand finalists will return to this year’s Championship match. Tony Popovic has rotated heavily for Asian Champions League matches this year, and his starting lineup will be more similar to the one from their final A-League game of the regular season. Aaron Mooy looks likely to replace Iacopo La Rocca in midfield, and the only other real debate is upfront – Tomi Juric is probably the better striker on paper, but played 75 minutes midweek against Guizhou, so Brendon Santalab may start ahead of him. The 5-4-1 has quickly become Phil Moss’s preferred formation. He used it midweek against Sanfrecce Hiroshima after two good wins over Brisbane Roar and Adelaide United. Therefore, his selection seems obvious, and he’ll probably name an unchanged side for a third consecutive A-League match. He has no new injury worries. Therefore, the tactical battle of this game feels predictable: tight, cagey and chances to be few and far between. That’s largely because of Moss’s new approach. After continuing in Graham Arnold’s legacy, he’s recently decided to go more defensive, asking his side to sit very deep against Brisbane Roar and soak up their relentless possession before counter-attacking quickly. The new formation is key to this – Nick Montgomery plays a hybrid defender/midfielder role, dropping into the back four to create a back five without possession, moving forward slowly to become a holding midfielder in possession. However, the Mariners have become increasingly reliant on counter-attacking through the pacy wide duo of Nick Fitzgerald and Bernie Ibini, darting in behind Mitch Duke upfront (who’s surprisingly not contributed much in terms of goals, but plays more as a target man in this system, battling for long balls and acting as a ‘decoy’ for the forward runs of the wide players). The interesting this is that while this new defensive approach is obviously logical against possession-based sides, because they play very high up the pitch and thus create space in behind to attack. Against a more cautious, direct side like the Wanderers, it would be tempting to suggest Moss will ask his side to play more proactive – however, the opposite seems likely. The Wanderers always seem to struggle against deep-lying defences, because their own game is reliant on breaking forward into space, something which isn’t possible if the opposition defence sits deep. Therefore, even though it’s not their usual approach, the Wanderers will probably have more possession here, which will inform Popovic’s likely selection of Mooy over La Rocca in midfield. The former is a better passer, and more likely to provide incisive forward balls from a deep position , particularly from right-sided positions. His direct opponent, Glen Trifiro, will have to be wary of not giving him too much time on the ball. Against Brisbane and Adelaide, Duke was instructed to pick up the deep-lying midfielder (Brattan and Isaias respectively), but in the absence of that type of player here, he might be asked to pick up Mooy. In the preliminary final, it was telling that Josep Gombau kept his full-backs in relatively conservative roles, perhaps wary of how exposed Shane Stefanutto and Ivan Franjic had been a week early by the Mariners counter-attacks. The positioning of the full-backs seems decisive – the higher up they are, the more space for the Mariners. Therefore, Popovic will probably ask Adam D’Apuzzo and Jerome Polenz to be cautious – their discipline will be vitally important, especially because the temptation will be for them to move forward, given how the Mariners concede that space with their formation. 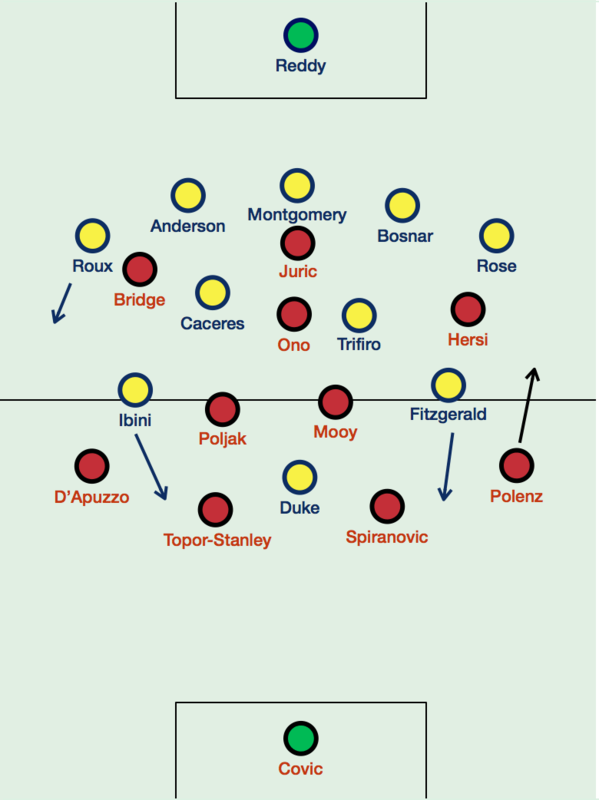 Polenz will get forward more on the right, though, and that could be the decisive zone – the key question being whether Polenz’s contribution to attack will outweigh the potential threat of leaving Fitzgerald too much space to attack into. The freedom of Eddy Bosnar to sweep across and help Rose against the multiple threats in his zone will be important – with the cover of Montgomery as an extra centre-back behind him, he’ll be keen to slide out towards the flanks and support Rose against Youssouf Hersi and Polenz. That would leave Montgomery to mark the Wanderers striker (either Juric or Santalab) against any crosses into the area – Santalab can time runs towards the near post well, and both players have good acceleration over short distances. This, again, could be an important factor, especially with the Wanderers being a cross-heavy side (something that likely will be exaggerated by the Mariners’ approach). Hersi could be the key player . He generally positions himself in the right channel, so would logically be picked up by Bosnar pressuring from behind. Hersi could beat him in 1v1s, or, if Ono moves across to that side, they can create overloads in and around the left side of the Mariners defence. It’s their key attacking strength – for example, in the 2-0 Wanderers win back in December, they scored both goals from attacks down this side. The majority of the Wanderers’ creativity will come from their right – on the opposite side, Bridge will play narrower, looking to get into goalscoring positions. With the Mariners midfield duo and centre-backs working hard to prevent opposition players time on the ball through the centre, Shinji Ono might have to drift into wider areas to find space. As aforementioned, the Mariners will probably focus most of their counter-attacks down their left, because of how Polenz gets forward more than D’Apuzzo. However, the goal threat will come primarily from Ibini, who scored a 90th minute winner between these two sides three weeks ago, but more pertinently, simply because he shoots more than Fitzgerald. An emerging combination between the two has been Fitzgerald bringing the ball forward, and then playing a long, sweeping cross-field ball to Ibini on the opposite side to attack the goal. In last year’s Grand Final (and subsequent matches between these sides) the Wanderers high press from the front four has been negated by the Mariners dropping John Hutchinson in between the centre-backs and creating a numerical advantage at the back. The reverse will happen here, as Montgomery will already be between the centre-backs – to whatever side of the pitch the Wanderers press, they won’t be able to cover the numerical disadvantage of 5v4, meaning there’ll always be an easy out-ball to either of the full-backs. In the Grand Final, the 1-1 at the start of the season and the 2-1 a few weeks ago, Rose getting forward was a huge problem for the Wanderers. It drew Polenz upfield to close him down, creating space in behind for the left-winger – or, as was the case most recently, meant Rose could attack goal directly, and he opened the scoring in the 2-1. In the Grand Final, he created a stream of chances with his crossing from the left, and at the start of the season, the progression of play through Rose upfield inadvertently lead to Duke’s opening goal. The key area then, in terms of both counter-attacks and longer possession play, is the Mariners left/Wanderers right – they both attack primarily down this side. Polenz getting forward will be important to the Wanderers breaking down the Mariners 5-4-1, but that will consequently create space for the Mariners to create chances of their own through quick, powerful transitions. When Rose pushes forward, too, he nearly always creates a goal in matches between these sides, and even though it’s been negated recently by their more defensive approach, the overlapping threat of both full-backs shouldn’t be overlooked. Ultimately, though, in what is historically a tight, low-scoring fixture, chances will be limited. The game might come down to who is most clinical.